I will admit it, I went into the adoption process a bit of a Debbie Downer. After dealing with infertility, IVF failures, and pregnancy losses, I didn’t have a whole lot of hope, initially, that adoption would be any different. I tried to tell myself it was different, but I still had days where I was convinced we would never get matched and we’d somehow for unknown reasons be the first couple in the history of our adoption agency to come away empty handed. Or, at the very least, that we’d languish on the waiting list for a long time. I had days where I was more hopeful, where I reminded myself that with adoption, it’s not an “if” but a “when” in terms of becoming a parent. But truthfully, it was difficult. In fact, the day we got “the call” that we were matched (and that our daughter had already been born), I was moping around the house feeling sorry for myself. I had a pot of pasta on to boil (carbs are my love language) for lunch that never got eaten because we got the call at noon. So, when I tell you to be hopeful, understand that I know how hard it is. No matter what the agency or attorney tells you, having a positive outlook on the adoption process is hard sometimes, especially if you’ve dealt with infertility, pregnancy loss, or infant loss. Maybe you’re on your second agency because the first one couldn’t get their act together. Maybe you just had a disrupted placement and are worried you’ll never get “picked” again. Maybe you’re adopting internationally and have been waiting months, or even years, to get that referral. Maybe you’re waiting for foster children to be TPRed, and even though your caseworker seems to think it’s a sure thing, you’re terrified it won’t happen. These (and more) are all 100% legitimate, fully understandable reasons why the adoption process can occasionally have you feeling more Eeyore than Tigger. And, in these or other difficult circumstances, I fully endorse your need to take a break, have a pity party, vent to a friend, cry in the shower, or do whatever it takes to get you over that hump. Because even though I was once less than hopeful about adoption, I have now seen the other side of it, and I can tell you, it is worth the heartache. Whether you are already a parent or not, even if you think you have an idea about how great it will be for this child to join your family, I promise you, you can’t fully appreciate the degree of elation you will feel when things DO work out. And they will—eventually. The “eventually,” of course, is the hard part. So what can you do while you wait to help you feel more hopeful? All the things that “other” parents do to prepare for a new arrival! I threw myself headlong into nursery preparation. I created a Pinterest board, picked out paint colors and wallpaper, and ordered furniture, including a crib I ordered online at 3 AM because I couldn’t sleep (it has drawers, okay? Storage is important). By the time we were ready to be matched, our gender-neutral nursery was fully done exactly the way I wanted it, and the drawers of the dresser we had refinished to match were full of very small baby-sized clothes. I also had a “go bag” with baby-sized things and necessities in case we got a stork drop and an excel spreadsheet that listed its contents and also had a list of what my husband and I would need to pack in the event of a stork drop. It sounds like overkill, but it’s a good thing I did, because after we got the call, we had about three hours to get everything together, get our dogs to daycare, go to the bank, wire money, get things notarized and FedExed, and hit the road to meet our daughter. Somehow we both still managed to forget things, but had I not had some degree of “stuff” prepared, I would have been even more of a hot mess as we were trying to get out of our house that day. Maybe nursery décor isn’t your thing, but maybe there’s something else you want to do before your new arrival joins your family. Want to join a gym to drop some pounds you’ll inevitably gain back while you live on takeout the first few months of your child’s life with you? Go for it. Have you been asking your husband for five years to get that dead tree taken out of your yard? Now’s the time. Forward momentum, of any kind, is your goal. Because, whether or not you realize it, you are moving forward. During the wait, we can feel like we’re in limbo. The paperwork process is so much “do this, get this, go here, sign this,” that once we’re just waiting, it can feel like suddenly all our “progress” has stopped, but that isn’t true. Every day you wait is one day closer to meeting your child. 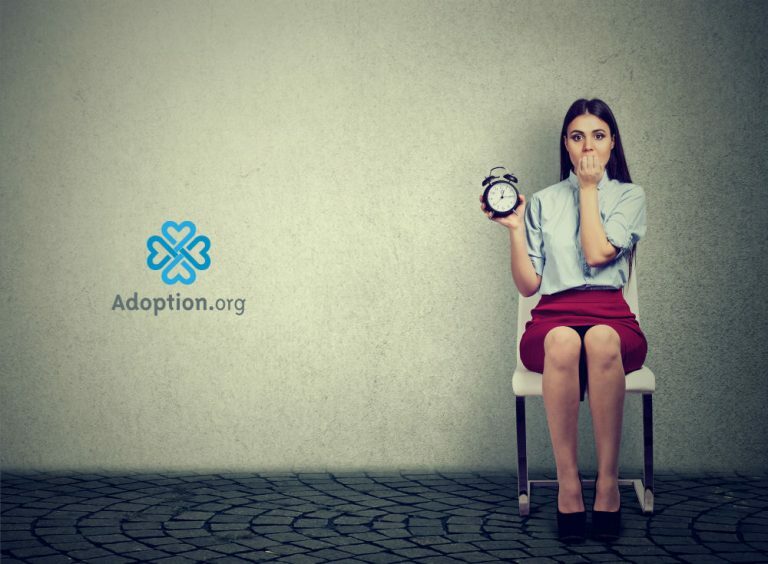 You may not know who they are, where they are, or when they will come to you, but with adoption, if you are willing to wait and willing to put your faith in the process, they WILL come to you. So, take a deep breath. Have a good cry if you need to. Then open the blinds. Let the sunshine into your home and your heart. Find something that helps you feel that you are continuing the forward momentum, and brace yourself because you have no idea just how awesome it’s going to be in the end.